Ever feel like relaxing with a mug of something nice and warm? Well, maybe this worksheet is for you more than for your kids! They think hot chocolate and you think tea or coffee. 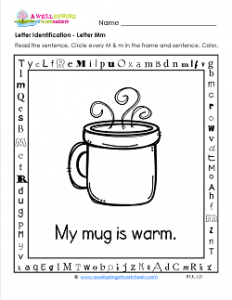 Anyway, you can have your cup of joe after (or while) your kids work on this letter identification worksheet for the letter m. Have them look for and circle all the m’s in the alphabet frame and in the sentence, “My mug is warm.” Be sure and have the kids look for the hidden sight word “two” in the bottom part of the frame. Please feel free to color the mug.